Neth Savoeun was sworn in as chief of the National Police Com­mis­sariat during a ceremony on Nov 21 at the Ministry of Interior, replacing the General Hok Lundy, who died in a helicopter crash on Nov 9. Interior Minister Sar Kheng promoted Neth Savoeun to the rank of 4-star-general and handed him the official rubber stamp of the Chief of Police. 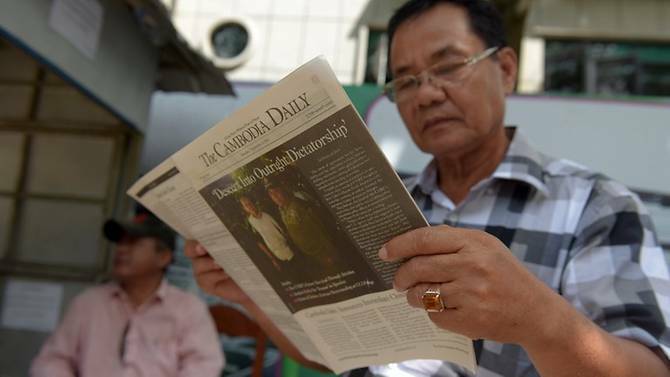 Sar Kheng also gave the new police chief some tips on reforming the nation’s oft-criticized police force. “Now I ask our anti-economic crime police officers, how much did they contribute to fighting economic crimes previously? There is nothing; I have never received reports from anti-economic crime police,” he said. Continuing his unprecedented and frank criticism of the police department, which is under the jurisdiction of his ministry, Sar Kheng said he had received complaints that “anti-economic police” had deployed to national roads to collect bribes from drivers of vehicles. “So our police have lost dignity,” he said. Sar Kheng also ordered Neth Savoeun to stamp out the practice of police officers paying to gain promotions. “I ask to stop the culture of brokering to get more ranks and appointments. Please stop it, if not, in the end, our police can not find experts to do the work,” he said.